Email marketing is a crucial digital marketing tactic for encouraging patient retention. When I say “patient retention” I simply mean the act of converting a previous patient into a repeat patient. It can be expensive to generate a new patient, so it makes a lot of sense to put a heavy emphasis on patient retention. 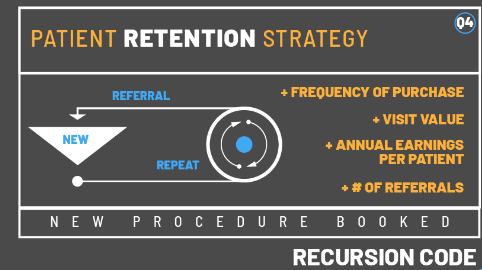 You maximize the yearly and lifetime value of that new patient by getting them to come back again and again. Aesthetic practices that rely on patients coming in with regularity, such as dermatologists, medical spas, and those who focus on non-surgical procedures can leverage email marketing to maximize the value of every new patient. Patients who have come in for CoolSculpting may also be interested in new deals on Botox. Similarly, new Botox patients may be interested in other non-surgical facial treatments. There’s a lot of appeal to non-surgical procedures; they are cheaper and require less downtime or recovery time than surgical procedures and there are more and more treatments than ever. This variety of new and better treatments gives patients more options, and these options are additional opportunities to upsell each new prospect who you convert into a patient. That’s where internal marketing tactics, such as social media marketing, and especially email marketing, come in handy. Once a patient has come in for a treatment, had a great experience, and seen amazing results, converting them into a repeat patient is that much easier. It’s not uncommon for patients to come in for a non-surgical treatment every few weeks, if not more frequently. Email marketing keeps your practice top-of-mind, alerting these patients of your specials and incentivizing them to come in again. Consider segmenting your email list to target patients and VIP patients based on how frequently they’ve come in and the procedures they’re interested in. These folks are the lifeblood of your practice so they should get the best offers from you. Some plastic surgeons do a little Botox here or there simply because patients demand it, and others perform strictly surgical procedures. Many cosmetic surgical procedures last decades so if you have liposuction, a facelift, or a breast reduction, chances are you won’t need to have that surgery again for a long time, if ever. A breast augmentation will likely require an implant replacement procedure, but not for 10-20 years, according to the FDA. Additionally, many patients opt to combine procedures, such as a tummy tuck and breast augmentation/lift, also known as a mommy makeover, or a facelift and eyelid lift. This is convenient for the patient and it increases the value of the new patient. However, it reduces the need for that patient to come back to your practice. Once a new surgical lead has been generated, they’ve come in for a consultation, committed to a procedure, and then had the procedure, you’ve maxed out the revenue you can generate from them, right? Possibly. However, that doesn’t mean that email marketing doesn’t have value for your practice. So How Can My Surgery-Only Practice Use Email Marketing? Review Generation: Reviews and before & afters are two of the most important factors that help push a prospect who has found your practice online into taking action. You can leverage email marketing to help build reviews. I recommend a review generation software, such as Magic Rating, which functions similarly to an email marketing platform but is much more robust. Capture Referrals: Turn your “promoters” – those who give you 5-star reviews or feedback – into referrers. You can strategically accomplish this by creating a feed, with a software such as Zapier, from your review software to your email marketing platform. As these promoters are added to your email marketing system they’ll automatically receive a customized email marketing follow up sequence that politely asks them for referrals. Done effectively, you can capture BOTH reviews and referrals from a single patient. Top-of-Mind Marketing: Even patients who have come in for multiple surgeries, such as a mommy makeover, without expressing interest in anything else, may very well decide that they’d like another procedure in the next year or two. Even if that former patient had a great experience, if you let two years or more, go by with no communication at all then that patient is much more likely to look elsewhere. We all have a million things going on in our lives, which is why services that send you monthly or quarterly beauty products, razors, or Amazon products are so powerful. They simplify your life. Why not simplify your patients’ lives and stay top-of-mind in case they decide to pursue surgery again in the future? That decision could be worth hundreds of thousands to your practice! Many Turbo clients, including dermatology, med spa, and plastic surgery centers have been seeing great results with Turbo. If you’d like to learn more about improving your practice reputation or increasing your star ratings then give us a ring at 877-673-7096 x2. You can also shoot us a note by filling out the form here.